This fantastic oreo cookie recipe was submitted by one of our members. These homemade Oreo cookies are similar to Oreo Cakesters in taste and texture. Preheat the oven to the temperature stated on the cake box. Mix the cake mixes, eggs and oil in a bowl until the mixture is well blended. It won't look anything like a cake mix, but it's not suppose to. It has to be thick to give you the soft cookie outside. When blended together, roll into balls whatever size you like. I usually make them the size of the rim of an 8 ounces glass when they are flattened. Put on a cookie sheet. Don't flatten too much. (You can use a fork to flatten them or your fingers). Place the oreo cookies in the pre-heated oven. Bake in the oven as per the directions on the box for cup cakes. While the outsides are baking it's time to make the filling. Beat the cream cheese until its creamy and has no lumps. Add vanilla and icing sugar and mix until blended. Place the icing in the fridge until the cookies are baked and cooled. 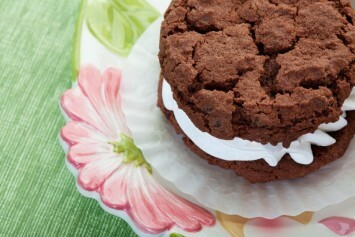 Once cooled, spread the cream cheese icing on one cookie and then sandwich it with another one. The yield depends on the size you make the cookies, but probably approximately 48 sandwiched Oreo sized cookies. Serve and enjoy. Happy cookie making. If you love this oreo cookie recipe, you will probably love many of our other cookie recipes too. Find them here.